Rates of subsidence are very uneven. In places the weight of large buildings has caused them to sink into the dried out mud. 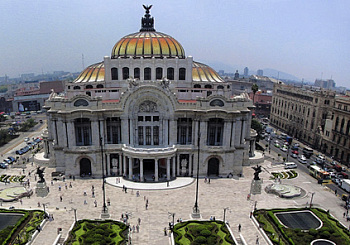 The city’s magnificent Opera House (Palacio de Bellas Artes, see photo) sank so far that its original ground floor is now a subterranean basement. To slow down the rate of sinking in the city center, in 1950 new wells were drilled south of the city reducing central city sinking to its current rate of about 10 cm (4 in) a year. Of course, areas in the south started sinking more rapidly. Elsewhere, buildings (including the Cathedral) have tilted and underground sewers and water pipes have cracked and broken. Furthermore, drains in the city center sank below the large drainage canals and pumps had to be added to lift storm water and sewage up to the drainage canals. These ground movements pose major challenges for the construction and maintenance of the city’s extensive metro network. This is a lightly edited excerpt from chapter 23 of Geo-Mexico: the geography and dynamics of modern Mexico. If you have enjoyed this post, please consider purchasing a copy of Geo-Mexico so that you have your own handy reference guide to all aspects of Mexico’s geography.